A native of Seattle, Leslie Brown Katz started violin lessons at age 4 with Genevieve Bradley, progressing quickly to study with Emanuel Zetlin. 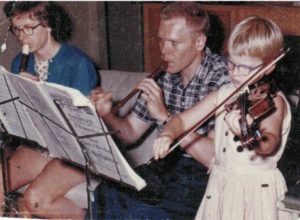 She was an accomplished violinist from an early age: winning the Kiwanis Competition in Vancouver at age 8, joining the Seattle Youth Symphony at age 11, and enjoying summer camp with the SYSO at Ft. Flagler. As a young adult, she studied with Berl Senofsky and Zvi Zeitlin at the Music Academy of the West in Santa Barbara, also winning the Chamber Music Award each year. Continuing studies with Eudice Shapiro (violin) and Gabor Rejto (chamber music) at USC, launched her international career as a soloist, collaborator and concertmaster. 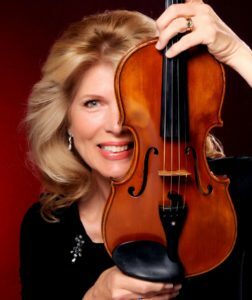 Miss Leslie has been concertmaster in such diverse posts as The Wayne Newton Show in Las Vegas, to The Norwegian Radio Orchestra in Stavanger, Norway, with a wild assortment of Los Angeles Film & TV Scores along the way thanks to composers such as Mike Post, who encouraged her to come to Los Angeles. Miss Leslie is an original tenured member of the Los Angeles Opera Orchestra. She performs regularly with the Los Angeles Master Chorale at Disney Hall, visiting ballet companies, The Wagner Ensemble, and the West Coast tours of opera star Andrea Bocelli. Mis s Leslie discovered the educational philosophies of Dr. Shinichi Suzuki thanks to her own three children. 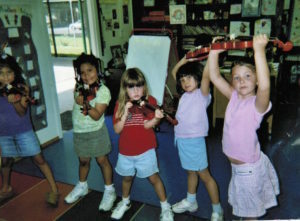 As an advocate for music, she persuaded her children’s kindergarten to let her teach Suzuki violin to every enrolled student. The program is now a part of the curriculum at eight elementary schools. Miss Leslie’s violin studio inspires students of all ages to lift the music off the page, tell a story, and master beautiful tone. Her students have won the top honors in the Royal Conservatory of Music National Exams. She also has students every year in the Suzuki Graduation Concert at The Colburn School. Miss Leslie joins the Faculty of the Marrowstone Music Festival every summer. There she performs chamber music, teaches orchestra skills, and shares her secrets to physical survival; musicians are athletes! Miss Leslie spends her free time reading historical novels and writing Rhythm Recipes. Her favorite way to relax is on the water. She even took her violin and Wagner “Ring” scores on a boat for a week just to get them in her fingers without distractions!